The progress on the studio continues. While I was away for a short trip to Denmark, the demolition was completed and new walls (closet space) went up. The best part of the new studio will be the views. Just take a look and see for yourself. Will I ever get any quilting done? can stick a camera thru your window for us to see. When do we get another update?? Inquiring minds want to know. Its been 8 months since the last and no internal finish work had been started yet. I want to see how it finished out and what reader suggestions and ideas were incorporated in the final design of the studio. Thanks! update, it may get my DH constructive juices flowing. Here's hoping. 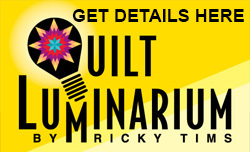 Ricky, any more updates on the studio. From a So. Colorado native, love that view. I used to have a veiw like that, miss it sooooo much. 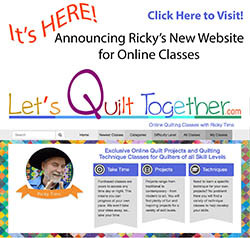 Ricky: You are amazing that you can keep us all in loop......love to watch your shows, and just renewed my subscription: got first one at CAPE COD WORKSHOP. what fun that WAS. Beyond Beautiful! I am your neighbor in Cuchara area up past Cuchara Pass Ranches, but live mostly in Houston, TX. When I am homesick for Cuchara, I look at your pictures (and mine). It truly is heaven. I am mostly a needlepointer and machine (Bernina) embroiderer. 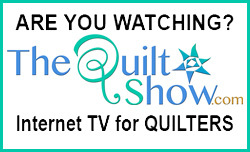 A friend promises to teach me to quilt. We will be attending your retreats at some point in the next year. Thanks. Glad to have you back in the USA. Looks great. Your wiev from your studio is almost as gorgeous as mine. That view is to die for! I'm jealous but happy for you. Wah! I'm sad about the little garden. But the studio looks great - and I LOVE the view! Wahato... ya!